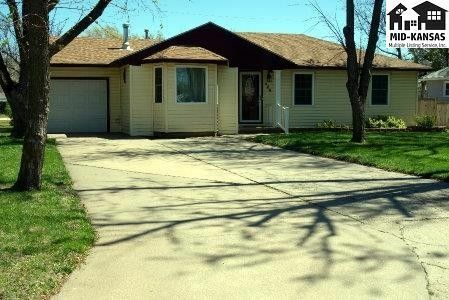 Quiet peaceful town, 30 min to Hutchinson, Wichita, Newton 15 to McPherson, convenient walking distance to schools within 2 blocks, 3 bedroom, wood privacy fenced groomed back yard, easy parking, large family/dining room just off kitchen, with easy access to the patio and kitchen, formal living room at entry, lots of addition and redo of this older home: bay window, larger master closet, nice concrete stamped 14X21 patio slab, easy mow back yard with landscaping to accommodate that. Own water well for yard watering, Central heat and air, new in 2006, Wood burning stove in living room 2001, new roof in 2008, Bay window added in 2009, Kitchen remodel 2008 including ceramic tile , Wood floors thru-out entry way, hallway, bedrooms, bedrooms refinished in 2010, ceramic floors and carpet in 2010, new doors and windows in 2011, bathroom completely remodeled in 2011, family room is " wired " for surround, home entertainment wiring recently added, large crawl space under home, newer cabinets above and around the washer and dryer, all PVC plumbing, access in attic access in garage and it is insulated, there is an attic fan (can be rehooked back up wiring is there, and fan and etc. ) Gas is available under home to be hooked back up should new owner wish to have gas cook stove (not provided) Burrton has convenience store, nice new fire station just few blocks away has community storm shelter, new restaurant "The Barn" a great new addition to this community. Burrton Schools.Easy Show.